Small businesses have to carry out everything on a tight budget, especially advertising. Advertising is generally expensive but it depends how you make out. Sometimes the businesses do not get the results they are looking for. Banner stands are the best for both the businesses; they allow the small businesses to stay within their budget by offering a huge variety of stands to choose from. Largeformat-print provides a variety of banner stands helpful in promoting your business. They are easily available at different rates suiting your budgets and also retaining a high success rate. And the main point is that they are very convenient and quick to set up. The bannerstands are useful for the businesses in various ways. The first way that they will help the company is by producing the results it is looking for. It makes the customers attracting towards the sale table, a direct sale on an end. At the end, the banner displayed on the stand will lead the way. And the second way they work for the businesses is by continuing to work even after the stand is paid off. The businesses recover the initial upfront cost and continue to earn profit in return. We, large format print offer wide range of products suiting your requirements. The bannerstand is used as a portable and lightweight marketing material that can convey your message or information to the target audience. 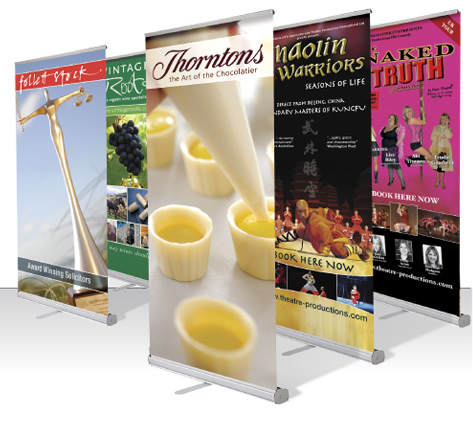 We provide a huge variety of sizes, styles and materials in the bannerstands to suit all your display and marketing requirements. We have variety of products ranging from roller banners to exhibition displays, offer professional service with friendly interaction to understand all your needs and requirements. Our main aim is to bring customer delight in all the services we provide. You can get your brand noticed in the industry and giving a face lift to the existing image in the market. We are biggest supplier of bannerstands and various other display products in the UK. Large format print produces magical graphics for the banner displays, gives wow factor every time you see. Give us a chance to impress you and further to your customers.